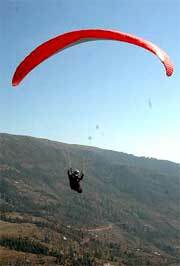 A view of paragliding trials in Panchari block of district Udhampur, Jammu, J&K. Udhampur, November 04 - With the successful conduct of paragliding test trials by an internationally acclaimed paragliding pilot in the lofty and scenic hills of Panchari block of district Udhampur, new vistas of adventure sports have been opened up for the enthusiasts of sports within and outside the country. Indian borne paragliding pilot, Mr. Adie Kumar, settled in Japan for the last 13 years who has been associated with this adventure sport since 1998 and holds the Indian League championship for the last three years, had booming test flights for the last three days in Panchari area. Admiring the scenic beauty with which Udhampur district has been blessed, Mr. Adie said the Panchari area has many potential tourism sites for international paragliders to test their adventure skills on this land. Mr. Adie who took number of test flights from Sankri and other adjoining hills of the area described these site as one of the best locations anywhere in the world. “Owing to all the favourable conditions for having a good paragliding flights in the area, we will plan some thing different during the month of April next year,” Mr. Adie said adding that efforts would be made to initiate adventurous paragliding expeditions from Panchari area with the involvement of top 15 paraglider pilots from across the world. After covering a distance of 1400 kms, the expedition captioned “Across Himalayas” would finally culminate at Sikkim, the pilot further apprised. The District Development Commissioner, Udhampur, Mr. Ajay Khajuria who was also present at the trial site last evening, said that Panchari block of the district has vast adventure tourism potential. To explore these destinations, the most talented paragliding pilots were given a proposal to see the feasibility of such events in the area. After the successful trial of test flights by a most capable paraglider pilot, the District Development Commissioner hoped that new vistas of adventure sports would be opened in the district which will definitely have a positive impact on the economic prosperity of the locals. On the initiatives of the District Development Commissioner Udhampur, Mr. Khajuria, a group of international paraglider pilot from different countries including USA, Sweden, France, Czech Republic and India carried out an exercise to assess the potential of the Panchari and Mada hills in the district for national and international paragliding events and spotted out these locations as best for holding the event.